Business is hell. Going out of business is worse. For some American businessmen, bankruptcy means years of hard work, a struggle to reclaim one’s hard-earned wealth and reputation by the application of fiscal conservatism and old-fashioned hard work. For others, it means a quick trip to Tijuana where smooth-talking wrestling promoters offer big bucks to any fool desperate enough to risk his life in the ring. As you might expect, this game is about option two. Secret Tijuana Deathmatch is a card game featuring clever strategy, funny wrestlers, and components from another game! 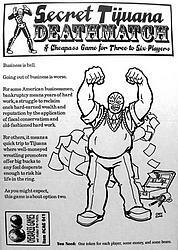 Players take the roles of Mexican wrestling promoters, cajoling bankrupt and suicidal American businessmen into fighting in midnight deathmatches. The game begins with each player drafting a stable of five fighters, and plays out over several rounds as these fighters meet, fight, and die. This game is limited to 5,000 copies, because it uses counters recycled from the Atlas game Spammers.